In order to jail this woman, a lot of people were needed: the police, the SNB (Slujba natsional’noy bezopasnosti – National Security Service, the successor of the Soviet KGB), representatives from the Presidential administration, prosecutors and judges. During the trial sessions the entire city of Dustabad was blockaded. She was accused for violating 18 articles of the Criminal Code of Uzbekistan and sentenced to eight years imprisonment. Authoritative international organizations, statesmen and governments of Western countries sought her release. She served two years and eight months of her imprisonment and underwent a serious operation during that time. 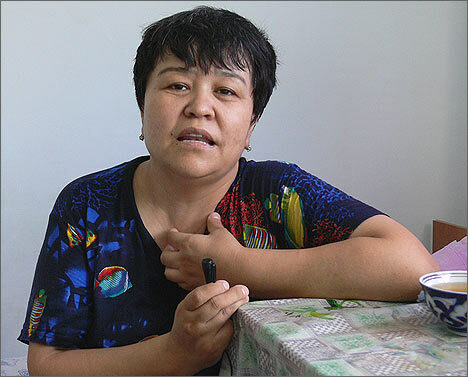 She is Mutabar Tadzhibaeva, founder of the “Flaming Heart” Human Rights Club in Ferghana, and was considered by authorities of the republic to be a direct threat to its survival. At present time, this human rights defender is being treated in a hospital in her hometown of Margilan. She is of a small height; she is vivid and always has a sincere smile on her face. Now, following her imprisonment, she uses a lot of prison slang. 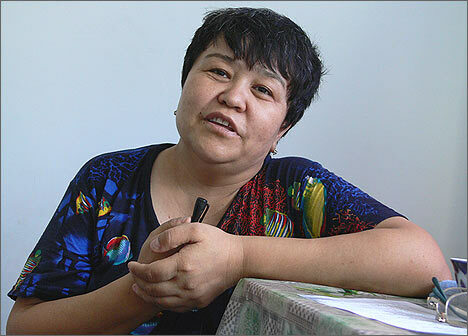 - My discharge was a surprise, not only for me but for women who were imprisoned with me. Also, for all my friends and relatives,” she recalls. “On the second of June I was laying in the ward (after the operation I used to be in a reclining position all the time). At 11 a.m. the administration asked me to come and told me to turn in all the things I was given in the prison – mattresses, bed linen – to the central warehouse. When I returned, I told the women that they [prison administration – Ferghana.ru] were going to transfer me somewhere else but they had not explained more. One woman said that she had recently heard that the next day two French journalists would come to our prison, so probably I would be hidden at Tashturma [Tashkent prison. 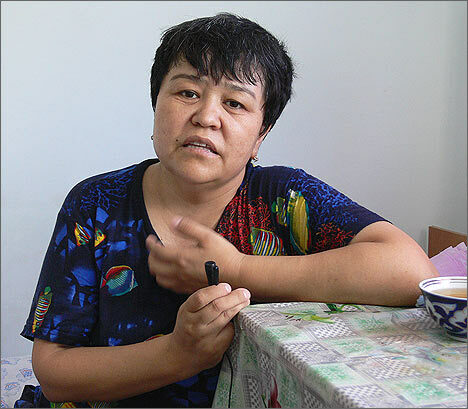 Mutabar Tadzhibaeva was serving her imprisonment at women's colony UYa 64/7 in Tashkent – Ferghana.ru]. I had the same feeling that they would try to hide me one last time, as when they tried to hide me from the Red Cross people. Then I thought that I would be transferred to Tashturma. But when I came back to my cell in such a mood the warden was waiting for me there. “Gather your things! Hurry up!” she ordered and gave me five minutes to do it. Women wanted to say “Good bye!” to me but prison security guards said: “There is no free time!” The women gathered around me and wanted to embrace and congratulate me. That time they guessed that I was going to be released. One woman, Simona Gorbunova, she was “otritsalovka” (prison slang – a person who is considered the most disobedient in the prison), came to me and embraced me: “Congratulations! Your tortures here are over!” All the women wanted to embrace me, but none of them were allowed to come close to me. When I came to the duty guard and gave back all the things, I asked him, “Where am I being taken to?” “We will tell you then,” he answered. They quickly took my things and gave me my old clothes, filed the documents, and in ten minutes I was already out of the colony. They told me that I was free, then, and said that according to article number 72 of the Criminal Code of Uzbekistan the remaining period was replaced by three years of a conditional sentence. And I signed the document of the Supreme Court from June 2 on changing the punishment and on my release. After 6 p.m. the policemen arranged a “Tiko” taxi car and brought me home in it. When I arrived, all the neighbors knew about my release; my daughter told them that her mother was released. They all gathered there in front of my house, waiting for me. When a police officer brought me by car, there were about 50 or 60 women, all the neighbors. They started giving a hug to me and congratulating me. My sisters and relatives also arrived there. That moment, I couldn’t believe I am at home, that I’m free now. Then, I was accused of violating 2 articles, then they added 16 more articles, charging me with 18 altogether. “These 18 articles are not still enough. Add more, I will prove my innocence!”… During the trial, prosecutors demanded nine years of imprisonment for me, but the judge sentenced me to eight years. The Prosecutor's Office protested, stating that my guilt was completely proven and correctly identified. I wrote them that if prosecutors complied with the law, then I would not be tried at all. Many times I got locked in the cell, and only twice they checked my health when doctors gave their conclusion, and they never checked me again, although I was feeling very bad. Once, during an inspection, I fainted away and fell. After that, I was taken to the medical department and after getting an injection I barely regained consciousness in an hour. But an hour later I was closed in the cell again. They wanted to make me write “pomilovka” [appeal for forgiveness – Ferghana.ru]. They said many times, “Why do you need this suffering? Write “pomilovka” and you can leave this place.” But I used to answer, “No, I will leave this place with the verdict of “not guilty”. Before the operation doctors told me that I have got a problem with a cyst… But right after they told me that they had removed the uterus. - How do you feel about yourself now? What kind of treatment did you receive in the hospital? - Here I am getting the treatment of a private hospital. …If there is a lack of some specialists they just go and find one. - Many human rights defenders are now released with one condition: not talk to reporters, not to give interviews, and not to be involved in any journalistic or human rights activities. Did anyone order you to obey such conditions? - No, nothing, either in written or oral form. But the head of Margilan police department, Kamoliddin Obidov, after congratulating me, warned again, “You probably know what is said in article 72. Please, read it carefully. If something is going wrong it means you will be sent to prison again. Remember this.” In article 72 it is stated that if crimes continue (if it is a crime to give interviews or publish materials, that I will definitely do), then they will imprison me so I return to serving the remaining 5 years and 4 months. But I still give interviews, and express my point of view on any issue I want. - Did someone try to pressure you - the police or other governmental structures? - Only once, when I was returning from the clinic, I noticed that some guy was making a record on a video camera from the opposite side of the street. …During the first week after my release, three to four cars were always parking close to my house; perhaps they were checking who was visiting me; something like an external observation. Nowadays, I can see none of them. What about threatening? None did it, everything is still fine. - What are your plans for future? Are you going to continue human rights activities? She stopped the discussion and asked me to make a record of the further words. - …I always see these women from the prison in my dreams. Probably they are waiting for me to do something. …On March 24, the representatives from the Red Cross questioned the women about their problems… Afterwards, the chief of the regime department, Lieutenant Azamat Egamberdiev, gathered everybody and said, “You told them (the representatives of Red Cross) that you were treated badly here… Therefore, you caused a problem for yourself.” He found one brochure in the library from one 18 year old girl who wrote a poem, entitled “Hey, Ona yurtim, onim, gururimsan, orimsan” (in Uzbek “My native country, my soul, my pride, my honor”) and now everybody should know this song by heart. …If not, it is considered as breaking the rules. …I want to assist in distributing this “singing a song” at least.